We partner with Fleet Team Inc. to provide our customers with the very best in material handling fleet management services. Fleet Team is experienced in managing all brands and types of material handling fleets including forklifts, reach trucks, order selectors, terminal tractors, and all other types of warehouse equipment. They assist clients on maximizing their bottom line by thoroughly understanding the needs of the client and providing the right mix of products and services. FM – Fleet Management: This program provides the equipment, service and maintenance for one fixed monthly rate. The program relieves you of the hassles of owning equipment and dealing with stringent leasing companies. It includes consolidated invoicing and management reports that show your fleet utilization, and maintenance costs. Service on your equipment will be performed by Forklifts of Toledo, or another authorized servicing dealer. You will know exactly where your forklift maintenance dollars are spent through a monthly and quarter expense reports. A personal Fleet Manager will help you with cost savings recommendations. TM – Total Maintenance: This program provides a flat monthly billing rate for service and maintenance only, on owned or financed equipment, usually for a 3-5 year period. It has no annual adjustment, but overtime charges may apply. It includes all monthly and quarterly reporting of your fleet’s utilization and maintenance expenditures. MM – Managed Maintenance: This program provides a flat monthly billing rate for service and maintenance. Any overage or underage difference are usually adjusted annually. It includes monthly and quarterly utilization and maintenance expense reports. 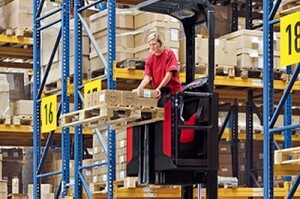 Contact a Forklifts of Toledo sales representative for more information. We will help you get started with a fleet management program for your material handling fleet.